Army twin brothers who got Major General ranks ... on same day! same day and were promoted as Major Generals on a single day together. It is a special feature that on their 53rd birthday which fell on this particular day itself they got these promotions. Jayantha and Puraka are the children of the couple Janaseeha Seneviratna and Leela Seneviratna and were born at Ratnapura General Hospital on September 6th, 1965 and no sooner Jayantha was born, a few minutes later Puraka saw the light of day. Both brothers have had their schooling at Ratnapura Seevali Primary School from grade one upto the GCE Advanced Level in one and the same class. Both of them have achieved similar results from the GCE Ordinary Level and subsequently have sat for the Advanced Level in the Maths stream and there too have secured similar results. After higher education both brothers have have joined the Army as cadet officers under course No. 21 on the 1st of November, 1985. After a month's training at Diyatalawa Army science faculty have subsequently set off for Pakistan for further training and after that training period have returned to Sri Lanka on July 24th, 1985. After that Jayantha Seneviratna was attached to the Singha regiment while Puraka Seneviratna was attached to the Signal regiment. Both of them had taken part in Balavegaya 1 and Wanni Vickrama operations and during the apex of the war the two of them had served mostly in operational zones, it was reported. Both brothers in fact were promoted as lieutenant, captain, major and lieutenant colonel ranks on one and the same day. Though later Jayantha Seneviratna managed to be promoted to positions of colonel and brigadier, since there were no vacancies in the signal regiment and though Puraka achieved promotions to these positions there had nevertheless been some delays in it. 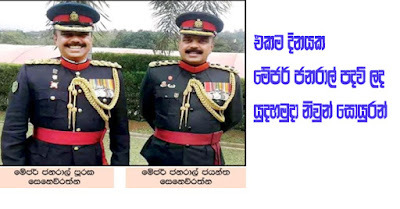 After these promotions these twin brothers had the fortune of securing promotions together last 6th and on recommendations of Army commander lieutenant general Mr. Mahesh Senanayaka directed to the President, both of them were promoted to ranks of Major general on the same day.